Thanks to everyone who plunged, donated, came to watch, took pictures or shuttled kids to and fro. 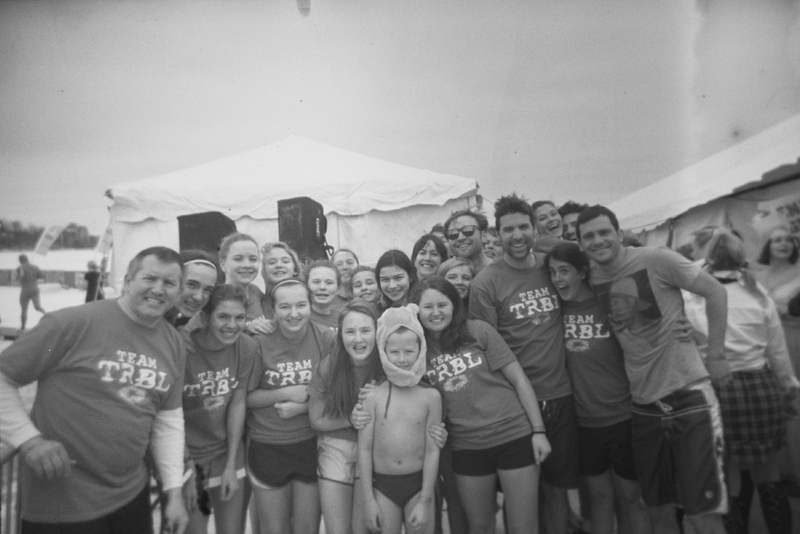 The 26 members of Team TRBL raised over $7,500, and a total of 4,000 people plunged today, raising over $600,000 for Special Olympics! It was a very chilly but fun scene. There were many creative costumes, ranging from penguins to Where’s Waldo, but the best one was AJ Lee, our 8 year old nephew. AJ walked to the dressing room with me, methodically assembled his outfit of Superman cape, Winnie the Pooh cap, rubber boots and blue Speedo, walked non chalantly past the sixty foot high inflatable polar bear and plunged into stardom in Lake Calhoun. The Prince of the Plunge was greeted with the rabid applause and high fives normally reserved for a returning astronaut. Too bad AJ was too cold to sign autographs. The plunge experience combined a cold blowing wind, chaos, second thoughts, ice cold water, a state of shock, a slow motion exposed run to the hot tub, a soothing 45 second dip in the hot tub, a lightning clothing change, an exit with still slightly wet clothes stuck to your skin, and finally back to that cold blowing wind. But in the process, raising money for a great cause, Special Olympics. The whole team, including the parents, but especially the kids, were tremendous today! And we celebrated Elisabeth’s Sweet Sixteen birthday. A wonderful way to spend a cold afternoon. This entry was posted in Weather and tagged 16th birthday, Polar Plunge, Really cold, Special Olympics. Bookmark the permalink.